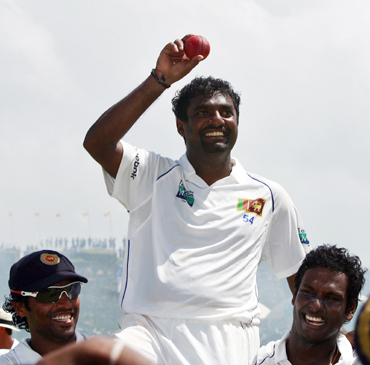 One of the finest but most controversial spinners of his generation, Sri Lanka veteran Muttiah Muralitharan bid an emotional goodbye to his 18-year Test career on Thursday with an unprecedented tally of 800 wickets. The 38-year-old bowler got the perfect send-off by guiding the Lankans to a 10-wicket victory over India in the first Test in Galle. He bagged the required eight wickets to reach the 800-wicket mark and firmly etched his name in the pages of cricketing history. Shane Warne, the legendary Australian leg spinner, is second in the all-time list, with 708 wickets. It was an emotional moment for the eye-popping spin giant, who was given a guard of honour by both the Indian and Sri Lankan players during the match. Firecrackers went off at the start of every day's play to celebrate his stupendous career. And, watched by his family, he ended with an amazing tally of 800 wickets in 133 Tests, to go with the 515 wickets he has in 337 ODIs. 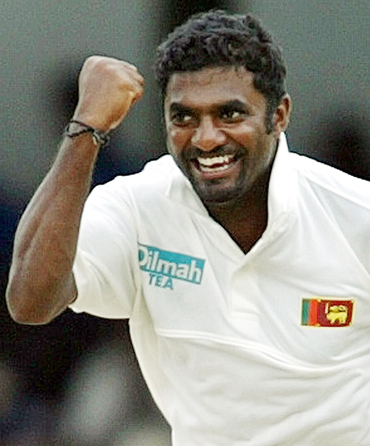 Although Muralitharan will no longer play Tests, he has kept open the option of playing the 2011 ODI World Cup, to be co-hosted by Sri Lanka along with India and Bangladesh. The off-spinner, who was called for throwing by a few umpires during his illustrious career, is one of the most talked about players in contemporary cricket. 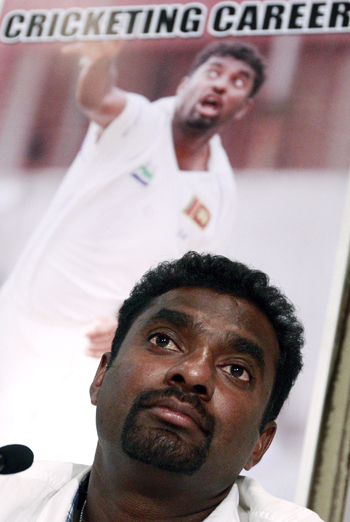 Muralitharan is one of the most successful bowlers in the history of the game but controversies were an integral part of his career. The cricketer, who made his debut in 1992 against Australia, had world cricket debating about his unorthodox and weird bowling action. Right from the beginning of his career, his action came under the scanner, and three years after making his debut he was called for throwing during the 1995-96 Australia tour by umpire Darrel Hair. The International Cricket Council (ICC) recommended a biomechanical analysis at the University of Western Australia and concluded that his action created the 'optical illusion of throwing'. The matter did not end there and again he was charged with suspected action in the 1998-99 Australia tour and this time Ross Emerson had doubts about his action. He was sent for further tests in Perth and England and cleared again. 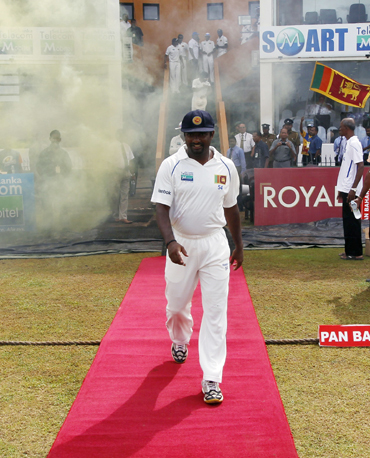 He faced the same charges in 2004, but the Sri Lankan kept taking wickets. In the same year he overtook West Indies' Courtney Walsh's 519-wicket mark to become the highest wicket-taker in Test history. Former India captain Bishan Singh Bedi is one of his most strident critics, and had once described him as a "monster created by the ICC". Bedi has always maintained that Murali's 'doosra' was an illegal delivery. He recently even went to the extent of suggesting to the ICC that the 'doosra' should be banned from international cricket, saying it is impossible to bowl it without bending the elbow. Murali had an enthralling battle for supremacy with Australian leg-spinner Shane Warne as both kept re-writing the highest wicket record. 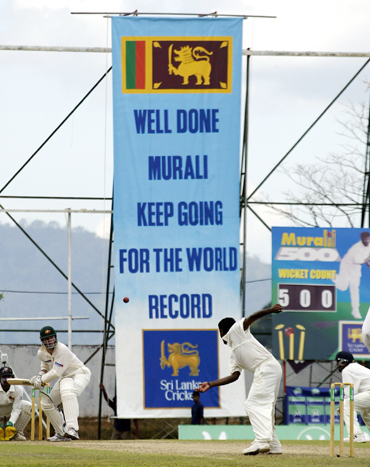 Warne retired with 708 scalps and Murali overtook him in December 2007, against England on his home ground in Kandy. 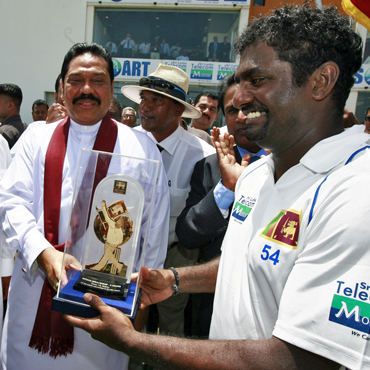 Murali achieved the grand double of being the highest wicket-taker in ODIs as well when he went past Wasim Akram's record of 502 wickets in 2009. The champion spinner could not do much in the 2007 World Cup, and it remains to be seen if he decides to play in the 2011 edition and help his side win their second world title. He has said it is difficult to bowl long spells, but expects to play Twenty20 cricket. He plays for reigning Indian Premier League champions Chennai Super Kings, who are due to play in the Twenty20 Champions league in September in South Africa. The 38-year-old spin wizard got Indian tailender Pragyan Ojha caught at slip by Mahela Jayawardene to reach the magical figure of 800 Test victims, which put him several pedestals above his contemporaries.